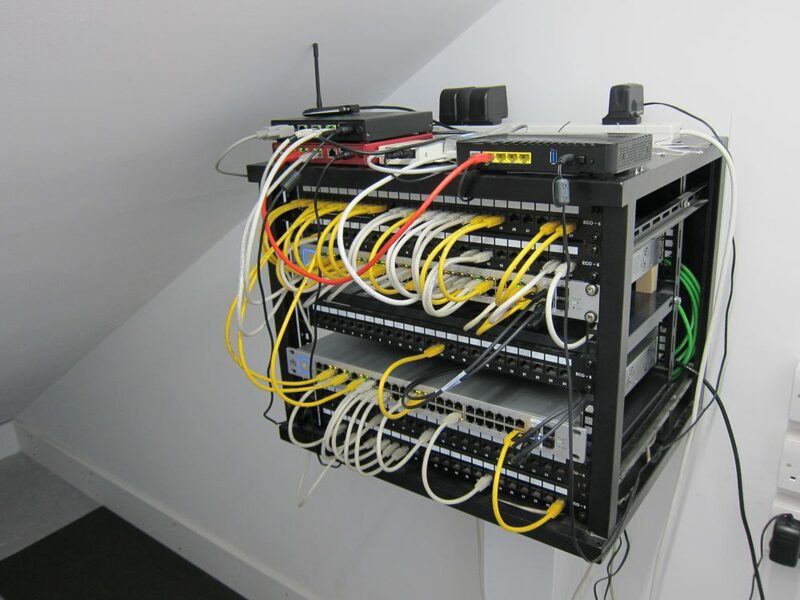 There are a total of 120 Ethernet network outlets distributed around the house which terminate in 5 x 24-port patch panels on the second floor. Some of these are used for specific fixed items like CCTV cameras (x5) and wireless access points (x6) whereas others are available in case there is a need to connect a portable device in a particular location. It’s highly unlikely that all of the outlets will be in use at any one time so there’s no need to have 120 switch ports available. Initially I started with a single 48-port switch which has been adequate up to now but the plan was always to have a second 48-port switch which I’ve just installed. The primary driver for the second switch is to double the port capacity but a secondary factor is that switches can fail and having two provides a degree of redundancy. Many of the devices rely on Power over Ethernet (PoE) which means that both switches must support PoE, which is unfortunate because PoE-capable switches are roughly double the price of non-PoE switches. Adding the second switch made it possible to greatly simplify the wiring to the patch panels, which now looks a lot tidier. The Ethernet switches (painted silver) are 48-Port UniFi models from Ubiquiti Networks, each capable of supplying 500W of PoE. These are linked together using 2 x 10 Gb/s UniFi DAC cables in their SFP+ ports (the black cables connecting to the right of each switch) so they pretty much act as one 96-port switch. However, strictly speaking they are not stackable switches which means they must be configured separately (no big deal) and also means they don’t support the more advanced types of link aggregation across the two switches. The plan is now to re-configure the main Router/Firewall (the red box at the top) to be wired to both switches in an Active-Backup configuration, so its connections will flip over to the second switch in the event of a problem with the first switch or with one of the ports or the cable. So far I haven’t decided whether to do the same with the HP MicroServer or to leave that with 2 x 1 Gb/s connections into just one switch (using LACP which uses both cables to provide high availability and also double the bandwidth). The window in the office on the second floor is large (5.5 m^2) and directly west-facing. It’s a nice feature and provides a great view but it does let the evening sun in which tends to overheat the office on the hotter days of the year. The answer is some shading. External shading is more effective than internal at keeping heat out and it might be sensible to add some fixed external shading in due course but for now I’m going to fit an internal blind and see how much of a difference that makes. One complication is that the top of the window follows the line of the north roof, which slopes at 12 degrees and means normal roller blinds (as fitted to the other windows) won’t work. A “bottom up” roller blind might have done the job but I settled on a vertical blind with slats of differing lengths that stack on the tall side of the window. Something that proved more complicated than I was expecting was arranging for motorised control – I want to be able to close the blind automatically based on the time of day, the temperature and the amount of sunshine. 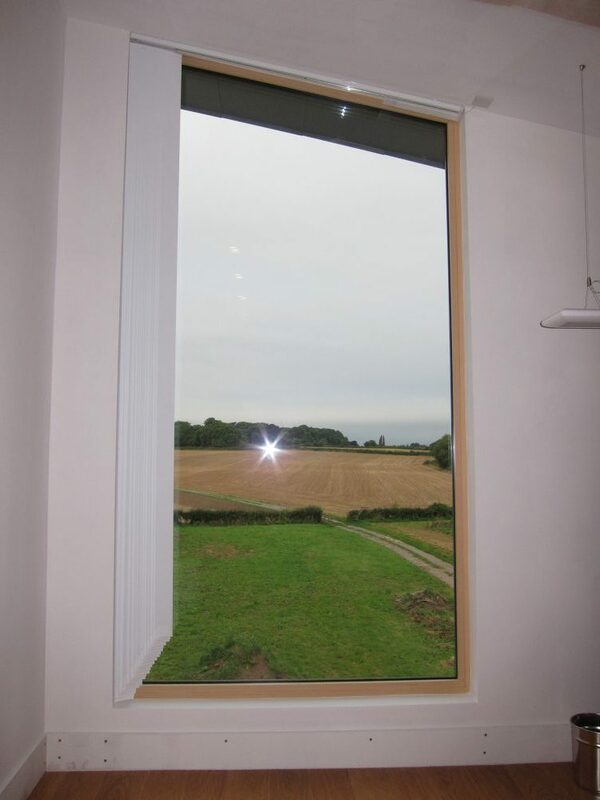 All of the windows have a connection point at one of the top corners for an electric blind, with a 3-core & earth cable which runs back to a control unit. 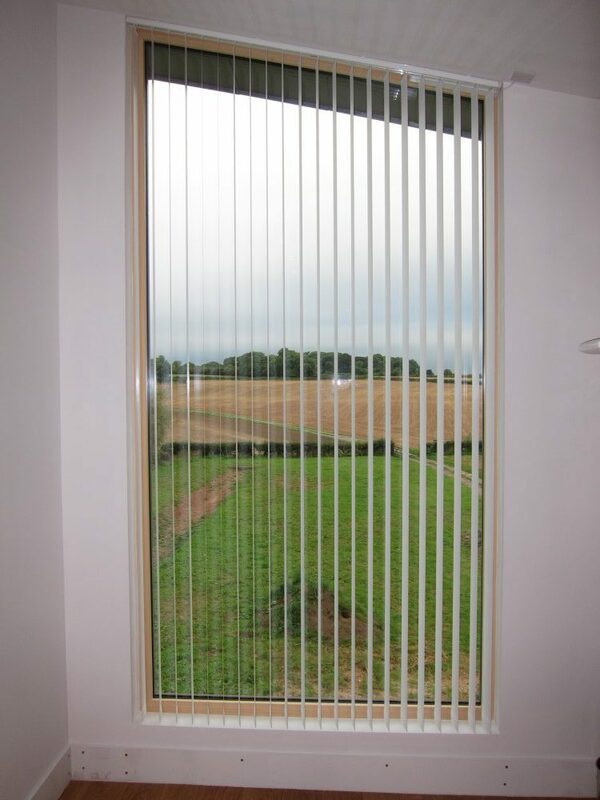 For most blinds this is fine – the 3 cores are used for Neutral, Live #1 (Up) and Live #2 (Down). However, my chosen brand of vertical blind motor wanted a permanent live as well as two switching cables, requiring a 4-core & earth cable. I briefly considered running a different / extra cable but then decided to pursue other options. In general I’m not a fan of radio control since in the past I’ve had issues with devices only working intermittently but it seemed like the least-bad way to go in this case. The Benthin IQ2 motor recommended by my blind supplier works with the Somfy RTS radio control standard and for manual control this works very well with a hand-held transmitter. For remote or automated control things are a bit more complex but the RFXtrx433E USB HA controller from RFXCOM supports the Somfy RTS protocol and is also supported by OpenHAB, my chosen home automation software. Using one of those also allows me to retire my old RFXCOM receiver which is listening for temperature and humidity messages from a range of Oregon Scientific indoor environment sensors.